OTTAWA — Political leaders at all levels offered comforting words and pledged to work together following Sunday's deadly shooting in Toronto, even as a new Statistics Canada report indicated gun violence is on the rise across the country. Thoughts and prayers for the victims flowed from all corners on Monday as municipal, provincial and federal leaders responded to the mass shooting, in which a gunman killed two people in Toronto's Greektown area and wounded 13 others. Prime Minister Justin Trudeau, Conservative Leader Andrew Scheer and NDP counterpart Jagmeet Singh all took to Twitter with condolences and messages of support, as did federal ministers and MPs from different parts of Canada. Similar sentiments were expressed by provincial legislators during a sombre session at Queen's Park, where Ontario Premier Doug Ford said the shooting was not only tragic, "it should be a cause for anger." The mood was also heavy at Toronto City Hall, where council has been grappling with a wave of gun violence that has seen more shootings this year than over the same span in 2017 — a trend that appears to be reflected across Canada. Statistics Canada reported on Monday that there has been a steady increase in gun crime over the past four years, with more than 7,700 Canadians having been identified as victims of such crimes in 2017. The number of gun-related homicide had similarly increased in recent years, according to the agency, with the latest statistics showing 223 gun-related deaths in 2016, just over half of which were gang related. The report also said that while Ontario saw a 10-per-cent bump in gun crimes between 2016 and 2017, there was a 47-per-cent rise in Saskatchewan and that most of the increase across Canada occurred outside of major urban areas. Still, Toronto Police Chief Mark Saunders said there was a "newness" to the wave of violence that has swept across the city. Though they promised to co-operate on gun crime, political leaders seemed to come at the issue from different angles. The new federal minister responsible for tackling gun violence, former Toronto police chief Bill Blair, was scheduled to meet Tory Monday afternoon after earlier tweeting that Ottawa was looking at ways to support the city's efforts "to end the violence." The federal government proposed legislation in March to tighten the sale and tracking of firearms, and has set aside $327 million over the next five years to fund programs designed to address criminal gun and gang activities. 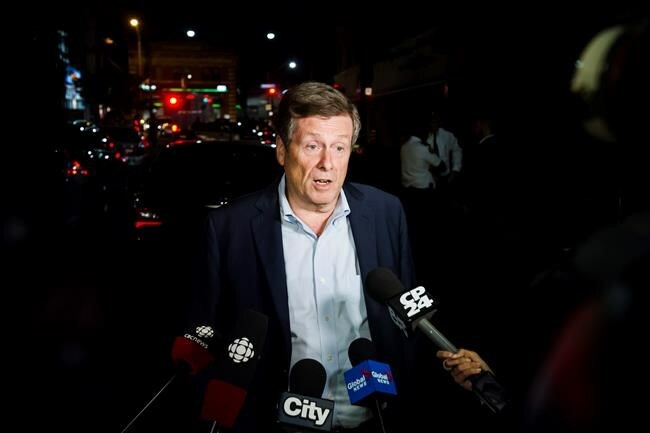 But Toronto Mayor John Tory, who has previously criticized what he believes are holes within Canada's gun laws, went even farther on Monday as he asked why anyone in Toronto would even need a gun. "To that end, I'll be reaching out to both the federal and provincial governments as they have reached out to us to urge them to sit down with us at as early a date as possible to discuss a range of public safety issues, including guns," he added. "I think it is fitting for us to revisit this issue, yes to protect our city, but also out of respect for those who have lost their lives and had their lives dramatically disrupted by this senseless violence." Ford, meanwhile, also called for discussions between the three levels of government during his address at Queen's Park, but his comments emphasized providing police "with the tools and resources they need to do their jobs. "And we will work with our municipal and federal counterparts to identify, apprehend and convict those who commit or plan to commit violence," he added. For his part, Saunders said there was "no magic pill that we're going to take to say all is well. "All layers of government have asked, what can they do too help? So we are in the process of having those conversations. But it's not going to happen overnight. … It is going to take time."